When and how has the dog become a helper for people with disabilities? 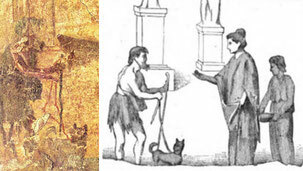 It is necessary to go back to the first century after J.-C to find the first trace of animal assistance. Discovered in the middle of the ruins of the Roman city Herculaneum, a fresco gives us to see a blind man led by his dog. The first formal dog training experiment to guide blind people dates from 1750 in the Parisian hospital Quinze-Vingt specialized in ophthalmology. A few decades later, an Austrian visually impaired person tries the experiment with his dog, a Spitz, and on the death of this companion, with a poodle. In 1819, the founder of the Institute for the Blind in Vienna, Johann Wilhelm Klein, published one of the first dog guide training manuals in which he recommended the use of poodles and shepherds and the use of a special harness. Several other anecdotes evoke the presence of animals in therapeutic approaches, notably horses and birds. In 1867, in Benfield, Germany, an institution for epileptics innovated by offering alternative care programs: therapeutic riding but also activities with other animals, including dogs. After the First World War, nurses at the Pawling Army Air Force Convalescent Hospital in New York used dogs as a therapeutic aid to traumatized soldiers. It is in Germany that the guide dog movement takes its contemporary form. As a result of the effects of mustard gas, thousands of soldiers of the Great War lost their sight. The legend says that Gerhard Stalling, a doctor of his own state, president of the German paramedics' association and owner of a German shepherd, let a blind patient wait with his dog. When the doctor returns from his errands, he finds that his faithful companion has adopted a protective behavior with the young man. During the war, Gerhard Stalling had trained some collies to find wounded soldiers, to report messages, but also to other tasks that could be useful. The observation of his dog’s attitude with his patient convinced him to entrust a new mission to the association: to teach these now inactive war dogs to guide blind veterans. After a decade of activities, the program stops. The German Association of German Shepherds takes over and opens an education center in Potsdam in 1923. At the same time, an American philanthropist, Dorothy Harrison Eustis, educates dogs for the Swiss army. She learns about the existence of the Potsdam school and goes on the spot to observe the techniques of education. In an article published by the Saturday Evening Post in October 1927, she describes her experience, and in particular her urban walk with a visually impaired person guided by her dog. Her conclusion is enthusiastic and insistent on the autonomy the dog brings. A 19-year-old man, Morris Frank, writes her from Tennessee. He asks her how to get a guide dog. In 1928, he goes to Switzerland and returns with Buddy. In 1929, Dorothy Harrison Eustis and Morris Frank found the first American guide dog school, The Seeing Eye, in Nashville, Tennessee. In American, it is still common to call guide dogs “seeing eyes dogs”. From then on, the concept moves to other countries. In 1928, an Italian guide dog school La Sculola Nazionale Cani Guida per Ciechi opens its doors in Geneva, Switzerland. In Great Britain, in 1931, four guide dogs are given to veterans of the First World War and the Guide Dog Association for the Blind was founded in 1933. Six years later, four shepherds imported from Germany are educated in a temporary military hospital from Tokyo Daiichi. It is not until 1957 that the initiative is renewed by Kenichi Shioya and 1967 for the Japanese Guide Dog Association to be founded. In parallel with this movement that will quickly become global, Boris Levinson, American psychiatrist remarks by chance, in 1953, the positive influence of his own dog on a young autistic and mute patient. Left inadvertently in the office, his dog interacts with the child who reacts positively. Following this first exchange, the child requests the presence of the dog. This is the beginning of what will be called "animal therapy". This dog opens the way for therapy dogs. The influence of Boris Levinson will be extremely important for the evolution of the animal assisted activities. In France, the guide dog movement is launched by Paul Corteville, a textile worker in Roubaix. During some vacations in 1951, he becomes friends with a visually impaired person. Passionate about dogs, he has heard of guide dog experiences in the United States, England and Germany. After a year of studies and experimentation, Paul Corteville hands over to his friend Dickie, the first French guide dog, in 1952. Subsequently, dedicating all his personal resources and his free time to this cause, he founds in 1958 the Association of guide dogs for the blind of Roubaix. 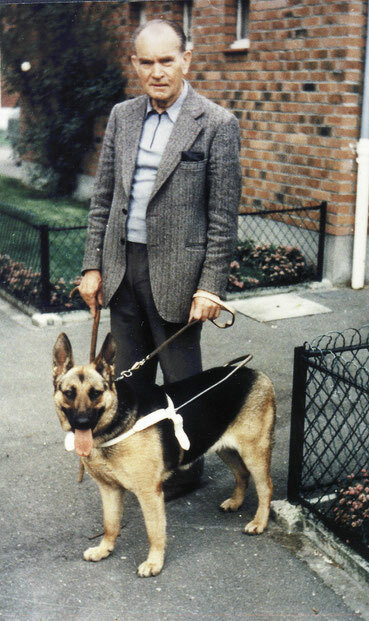 In 1972, thanks to a collection of donations from the freed Parisian, Paul Corteville opened the School of guide dogs for the blind of Wasquehal. At the same time, the National Federation of Clubs and Schools of Dog Guides for the Blind was born: it will become the French Federation of Guide Dog Associations (FFAC). Eleven more schools will open in the next four decades. The same year in Spain, Mr. Picornell, after a short stay at a dog guide school in the UK, opened the first training center for Spanish guide dogs in Sant Joan (Majorca). While many dog-guide schools sprang up all over the Western world in 1975, Bonita Bergin, a doctor of psychology, decided to educate the first assistance dog for people with reduced mobility. At first, she turns to guide dog schools but finds that skills do not exist and the guide schools are overburdened with requests and are slowly professionalizing their activities. She perseveres and develops her own educational program, founding the association Canine Companions for Independence. It is with Bonita Bergin that Marie-Claude Lebret will be trained to create Handi'chiens (a member of Canidea) in 1989 in France. After discussions at meetings in the late 70s and early 80s, the International Guide Dog Federation is created in 1988: from its kick-off, it brings together 25 schools. They are 90 in 2018. Elaine Smith, an American nurse practicing in Great Britain observes the benefits of animal presence on patients. Returning to the United States in 1976, she creates Therapy Dogs International with the intention of spreading "pet therapy". Unlike its title, it will only operate on US territory. Other associations aiming to federate the actors of the mediation will be created in the years 90 and 2010. We will note in particular the International Association of Human Animal Interaction Organizations (IAHAIO) founded in 1992 and Animal Assisted Activities International ( AAII) in 2013. In 1977, Roy G. Kabat, a former showman specialized in exotic animals, is contacted by the American Humane Association. A hearing deficient woman had a dog who had gradually learned to signal the sounds of the house. When her pet dies, she becomes aware of her dependence on her skills. She is looking for someone who could teach a dog such skills. The American Humane Association decides to try the experiment with Roy G. Kabat. He founds Dogs for the Deaf, later to become Dogs for Better Lives. These dogs will be called "hearing dogs". Through the Lions clubs, the initiative continues in Australia with the Australian Lions Hearing Dogs founded in 1980. Like their American counterpart, the British cousin, the Hearing Dogs for the Deaf starts alone the experiment in 1982. The concept is gradually penetrating other countries, for instance Switzerland and Spain. An attempt will emerge, quickly aborted, in the 2000s in France. Today, this type of dog is matched with people by the association of dogs of silence founded in 2010 (member of CANIDEA) by Cathy and Frédéric Bire. The American hearing dogs associations will meet at various conferences in the 1980s, bringing together 21 organizations in 1981 and continuing to grow. In 1987, they decided to formalize their union under the name Assistance Dogs International (ADI). In 1981, Éric Saint-Pierre creates the MIRA Foundation in Quebec. Initially focused on visual impairment, it will quickly diversify its activities with new specializations, some innovative, which appear in the 90s, including the matching of assistance dogs to children. The initiative will be taken over in France by the Fréderic Gaillanne Foundation, a non-profit organization in 2014: the FFG gives pairs dogs to visually impaired children, assistance dogs to autistic children. It is the only organization in the world to pair helping dogs to visually impaired children to children under six. A 1999 scientific article discusses the basis of dogs' ability to prevent epileptic seizures. It is based on dogs that report spontaneously and on dogs that have been educated for this. The educated dogs mentioned in this study were trained by the British Support Dogs Association, founded in 1992. In 1996, the Canadian mother of a three-year-old autistic child is desperate for a service dog to help her son. A Canadian association, National Service Dogs, is created to meet this demand: it pairs the first assistance dog for autism with a child in 1997. It appears that the first dogs for post-traumatic stress disorder were matched to American and Canadian veterans in the 1990s, following the conflicts in Iraq. They would have been trained by dog associations for motor handicapped people and individual initiatives of former military. Since then many organizations have focused on this specialty. In 1999, Mark Ruefenacht, a Type I diabetic, has a crucial experience with Benton, a guide dog in training. While he is traveling, his blood sugar drops. The dog adopts an inconsistent attitude with his normal behaviors and this alerts him of a problem before he loses consciousness. 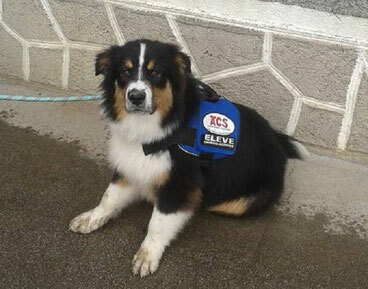 This incident gives him the idea that service dogs could be educated to detect episodes of hypoglycemia in diabetics. In 2004, Dogs4Diabetics is created in California and the first alert dog is matched. In France, ACADIA, created in 2015 by Arnaud Bertrand, is the first association to educate alert dogs for diabetics. It made its first matches in 2018. It had joined CANIDEA in 2017. In 2006, Canine Partners 4 life, an American service dog association, matched the first heart warning dog. In the early years of 2010, 4 paws 4 abilities, another American association, started matching specifically educated dogs to children with Fetal Alcohol Syndrome (FAS), Fetal Alcohol Spectrum Disorder (FASD). The training is very close to that of service dogs for autism spectrum disorder. Founded 2000, ADI's European counterpart, Assistance Dogs Europe (ADEu), brings together 13 schools with various specialties. In 2007, ADI changed its statutes to integrate ADEu and create a North American branch for its members. At the same time, animal assisted activities are becoming professional, with training such as the one offered by AGATEA in France. The training of such dogs is an illustration of this professionalization. Dogs who not become guide dogs or assistance dogs are oriented towards such activities, while progressively the set up of a primary orientation, ie as soon as possible towards this type of activity. In France, the schools of therapy and utility dogs of the East and their counterpart of Provence Côte d'Azur Corse were founded respectively in 2015 and 2016 to train such dogs . Today there are dozens of schools in North America and now in Europe since Eastern Europe joined the movement after the fall of the Berlin Wall. Asia has a few initiatives, as does Latin America. The African continent has only one school in South Africa. With the discovery of multiple canine skills, the field of possibilities was opened in the year 2010. It gives a glimpse of fantastic prospects and gives hope for the relief that our hairy friends could bring to vulnerable people seeking more freedom. 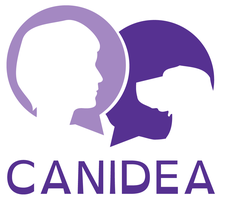 In France, CANIDEA , which in 2018 brings together 12 members educating and / or working with guide dogs, service dogs and assisted activities dogs, was founded with the aim of pertaining what exists and bring to reality what is possible.